The operatives of Rapid Response Squad of the Lagos State Police Command early Thursday morning busted two motor bike robbery gangs in Ajah and Mushin and arrested some members of the gangs. 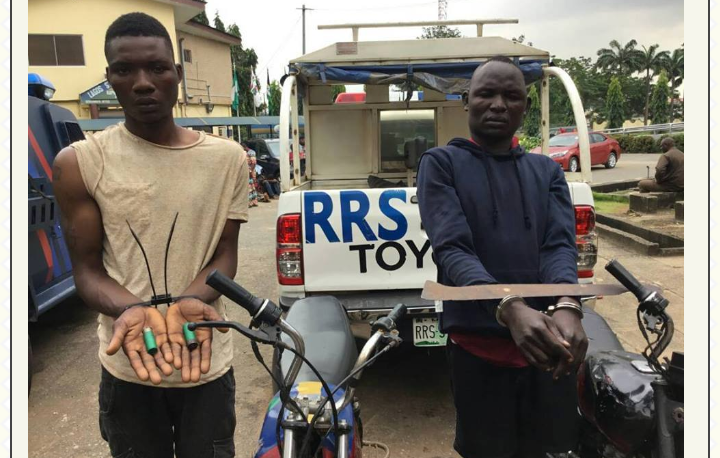 The suspects: Muyideen Adegboye, 25, a furniture maker in Idi-Oro, Mushin, and Idris Farouk, 26, an okada rider in Ikate Area, were arrested at separate incidents while using motor cycles to rob. Muyideen Adegboye was arrested at about 3:00 a.m. with a stolen keke and two live cartridges while his other gang member escaped leaving behind the motorcycle the gang used for the operation. Farouk on his part was arrested at Ikate Roundabout around 4:35 a.m. after himself and his gang member on okada with the aid of a cutlass robbed one Samsudeen Abiola of his phone and money. Farouk added that himself and his accomplice, Wale, still at large, were robbers. He added that they operate around Ikate and Small Kuramo stealing okada. Confirming the arrest of the two gangs, the Police PRO, ASP Olarinde Famous-Cole, said that police are on the heels of other members of the gangs. He added that those arrested have been transferred to FSARS for further investigation.